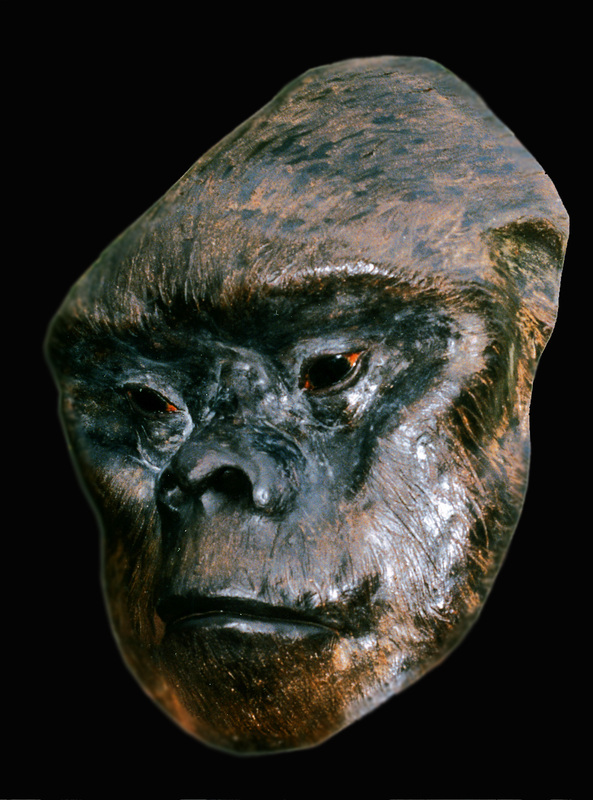 OVERVIEW OF THE SASQUATCH AND OTHER HOMINOIDS GALLERY - Sasquatch Canada contains current and authoritative information on sasquatch and other homins. at the end that gives a good sense of the entire exhibit. of vice, violence and lawlessness. forward on a very positive note from there. providing me with a “show piece” for future sasquatch exhibits. 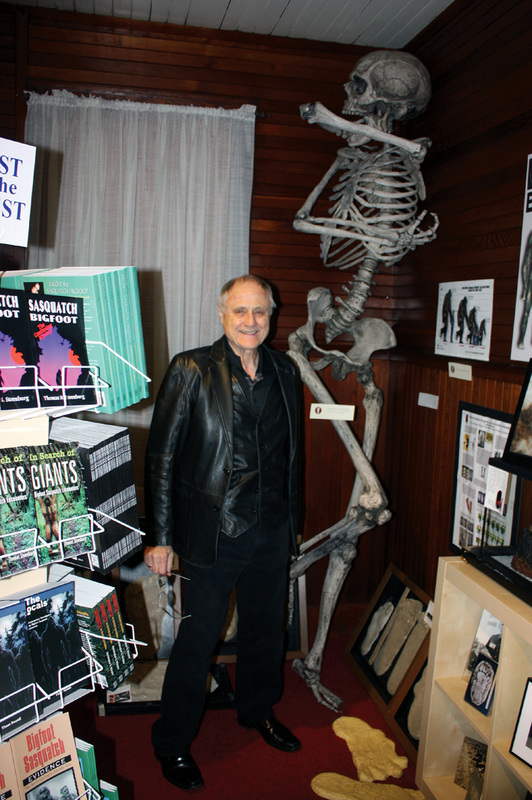 (Although nothing but bones, it weighs some 300 pounds). 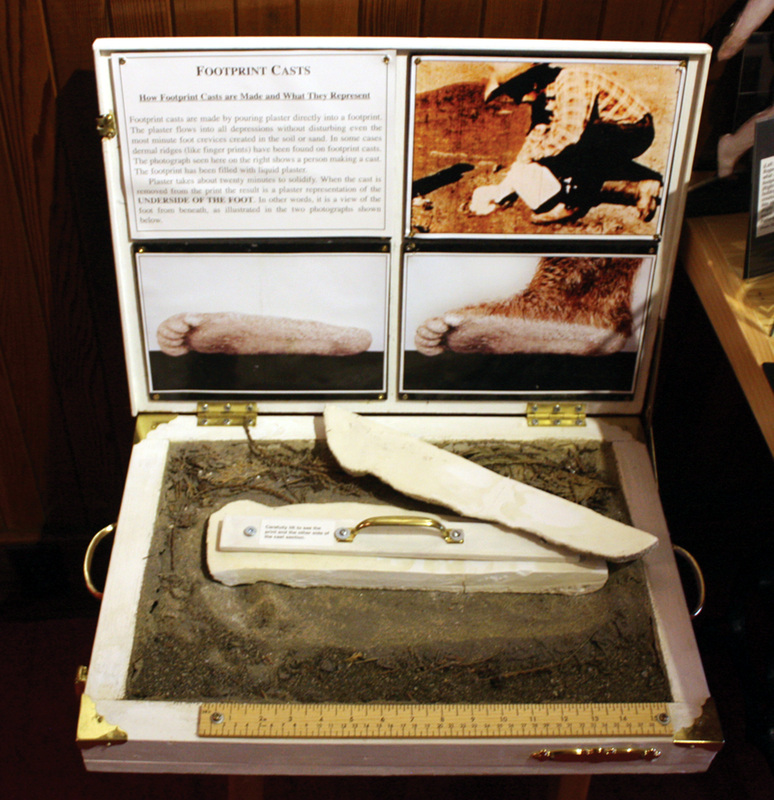 Footprint plaster casts are the mainstay of any sasquatch exhibit. This presentation shows how casts are made and exactly what they represent—a view from BELOW the foot. 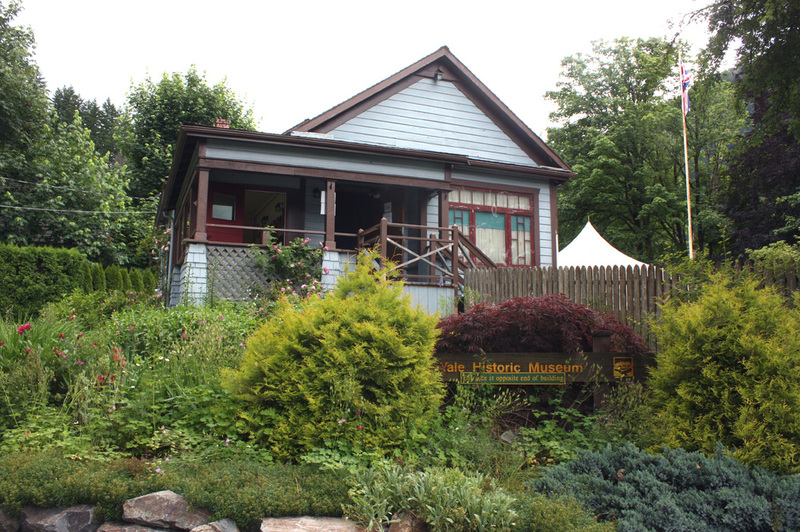 This is important for the numerous grade school children who are taken to museum exhibits. The sasquatch is high on the list for these future researchers (they are my biggest fans). 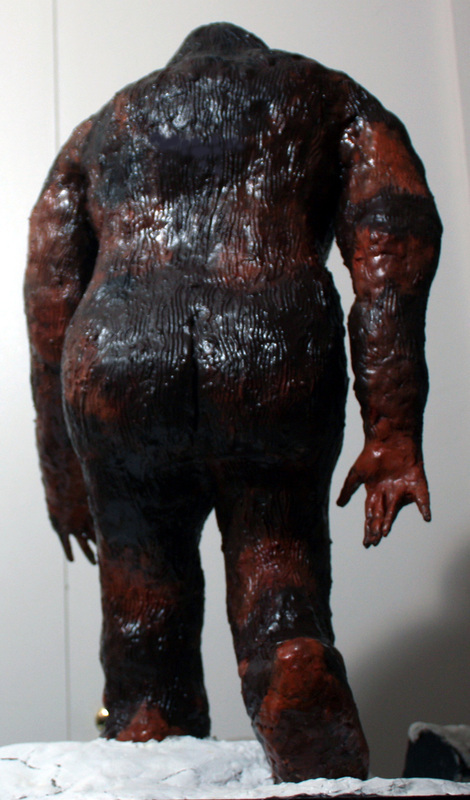 This is a clay sculpture I created in 2011/12. The creature is not only ugly, it’s kind of comical. For sure, if there were an animal beauty contest, primates would not even make the top 100. 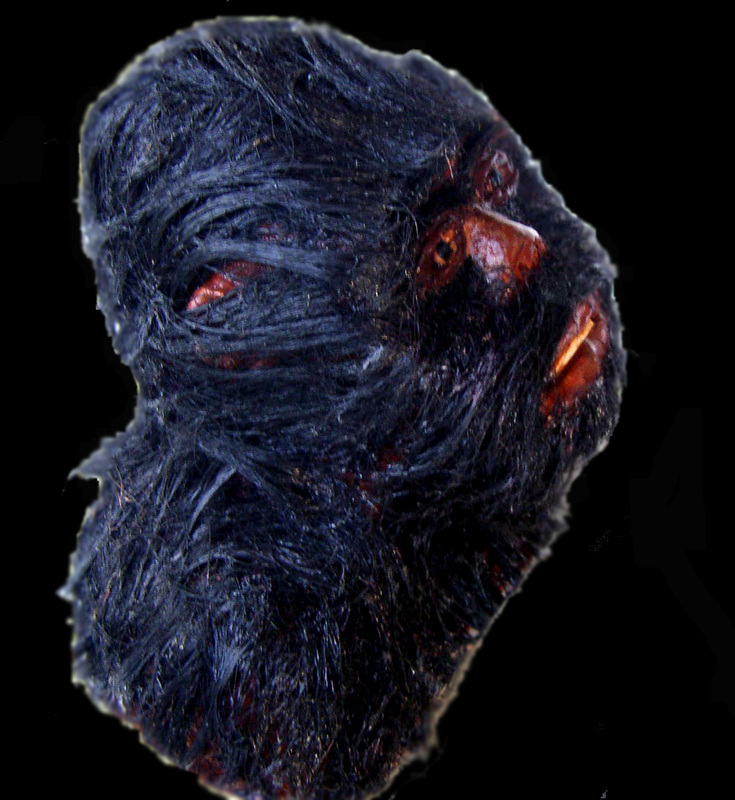 For those who might think the sasquatch looks like a champion body-builder covered with hair, I think you are sadly mistaken. Of the thousands of sighting reports, I have not found one that gives the creature Greek god features. Indeed, we see the complete opposite—a very large, scruffy, frightening thing that has a terrible odor. 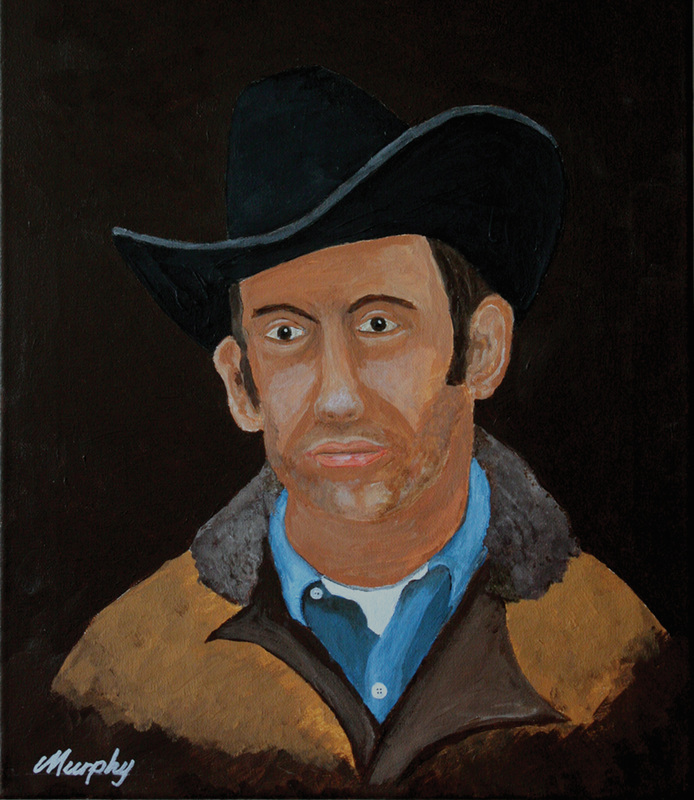 I used as much as I could from sighting reports in British Columbia to create the rather unflattering work. If the creature is a “human” of some sort, then it goes back a long, long way. 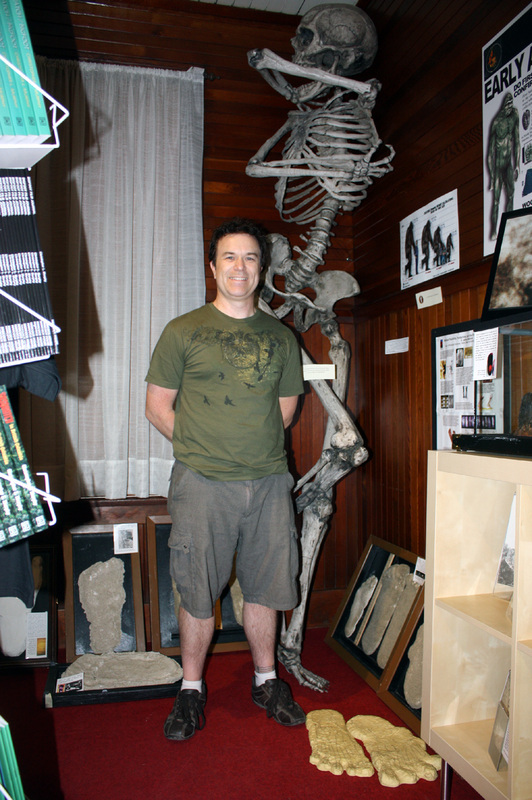 I am shown here with my sculpture at the museum. I am holding a 16-inch footprint cast. Please try imagine how large the sculpture would need to be to have feet the size of the cast. Now use your imagination to bring the creature to life. Is there any wonder why people “forget themselves” when they see something like that? Even if they can retain their composure, how close do they want to get to the oddity? These are major factors that limit photographic evidence. 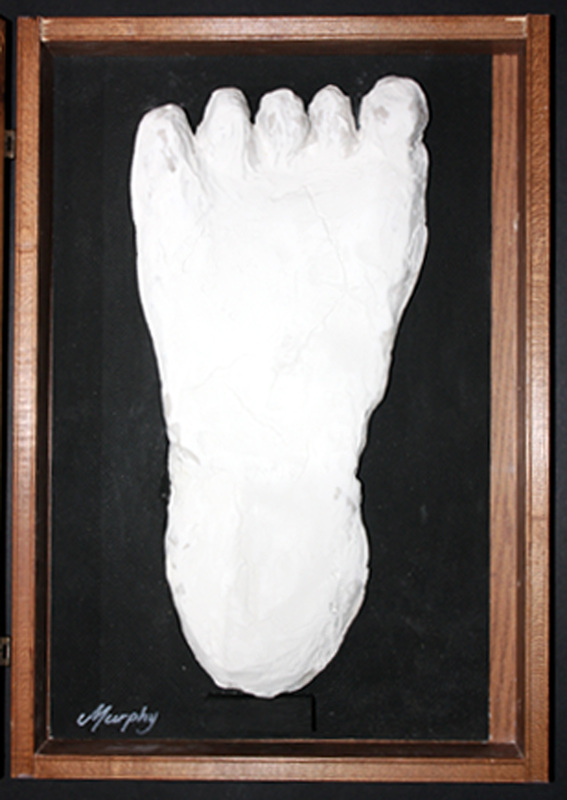 This is a clay foot I created to get a simple appreciation of how a sasquatch foot might appear from above. However, it does serve to illustrate an important point. 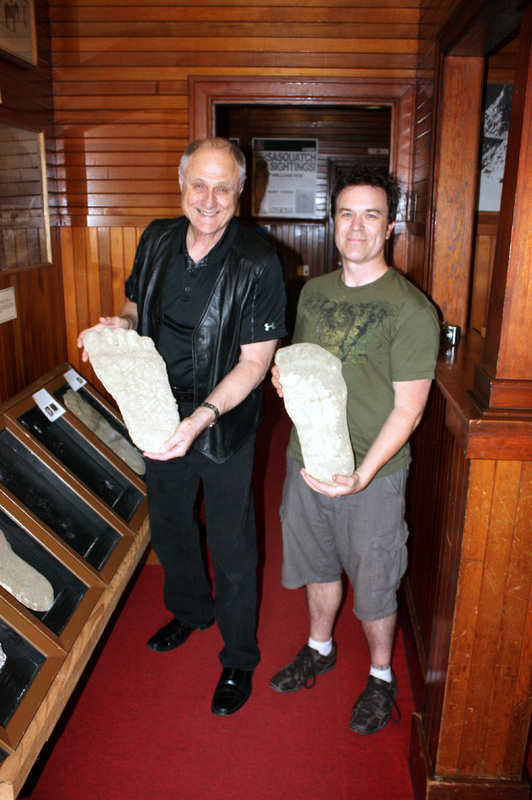 The sole of the foot is an actual 16-inch plaster cast. It is totally buried in the soil as would be the case with soil of this nature given the weight of the creature. However, if the soil were softer, then even more of the foot would register. If it were harder, then less would register. I believe the size of a footprint can vary as to the size of the actual foot by about 8% (larger or smaller) depending of the type of soil. Many footprints found that only marginally make an impression were made by a foot considerably larger than the impression seen. 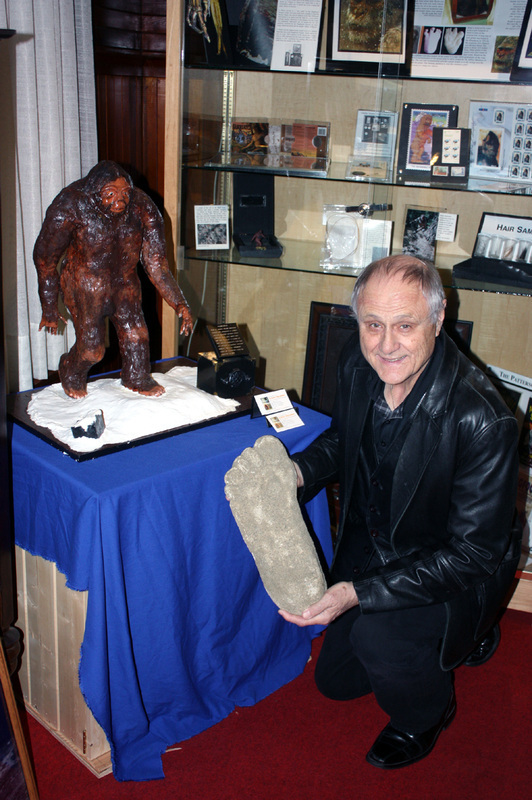 A 12-inch impression (human size–higher range) could have indeed have been made by a 13- inch, or larger, foot (sasquatch size–lower range). model were those recorded when the film was taken. 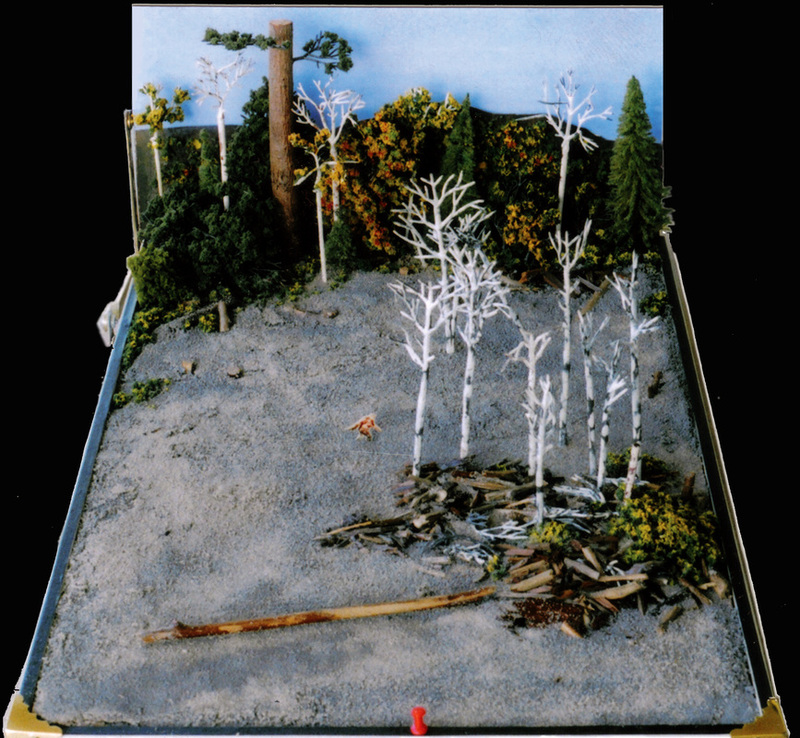 proceeded directly ahead rather than seek cover in the background forest that appears to be very close in the film. made in Japan and marketed about 8 years ago. This is a piece of actual 16 mm film from a copy of the Patterson-Gimlin film. The width of the strip, including the edges is 16 mm. The image portion is 10 mm x 7 mm. The creature seen in the film is about 1.2 mm high.The fact that an actual film camera was used (as opposed to standard video camera) has enabled us to get reasonably good enlargements of the film frames. However, had a high-quality video been used with full close-up (zoom) in use, then I believe we would have had a better movie, and better still images. 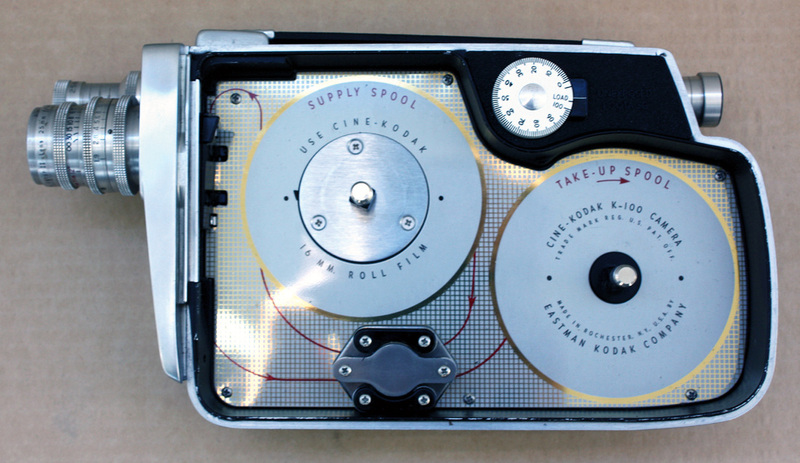 would be 16 frames per second, in which case a 100 foot film roll would last about 4 minutes and 23 seconds. Although the camera is very old technology, it was perfect for getting photographs of animals -- far better than a standard camera (much like a machine gun compared to a single shot rifle). 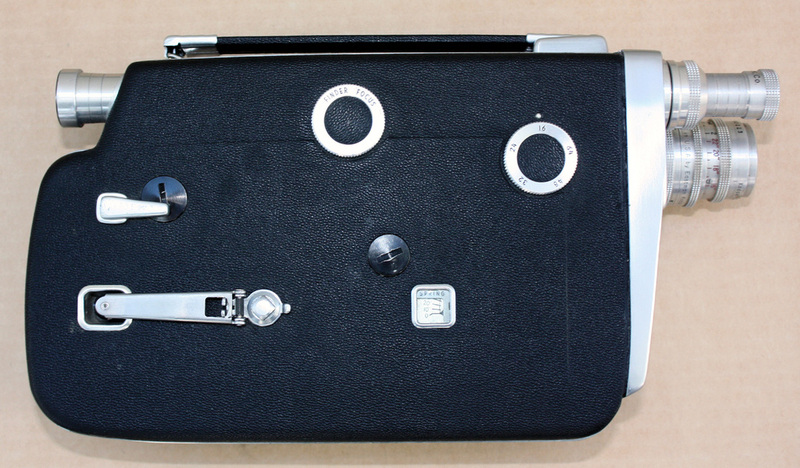 The main draw-backs were its size and weight (9” x 5.75” x 2.5” and 5.75 pounds). Also, when you changed a film roll, this had to be done in the dark. the Chehalis First Nations Band in British Columbia. 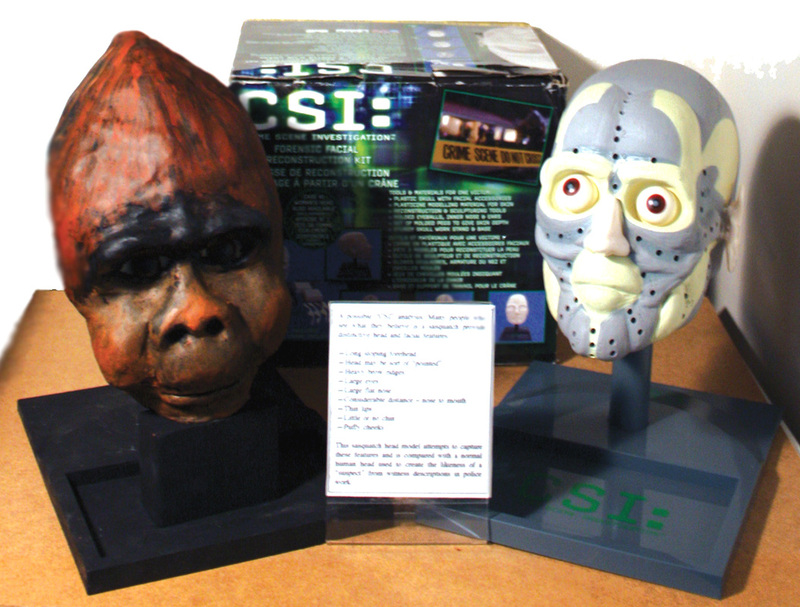 The head seen here is the same as that on the logo, which is reminiscent of the creature in the Patterson-Gimlin film when it turns to look at the two men. expected only one head, but she created four, all different in appearance. Penny had reasoned that the sasquatch were likely similar to humans with individual facial features. 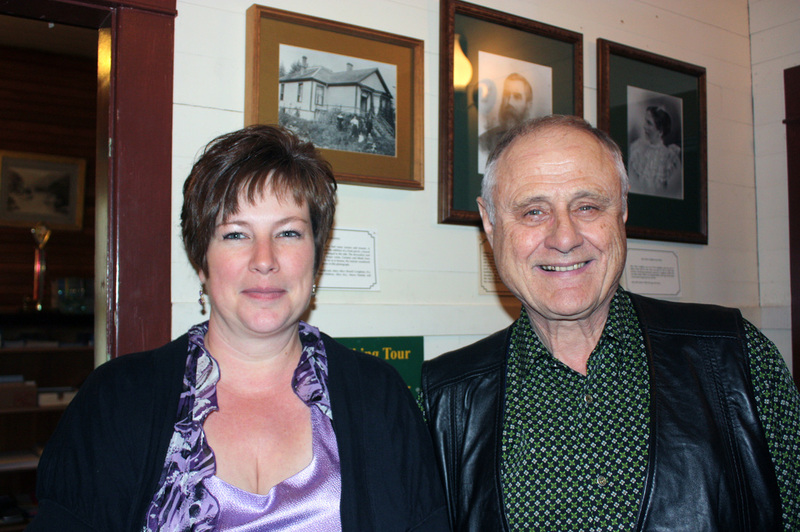 Penny gifted me one of the heads, shown on the right, which I now use for museum exhibits. Penny has created many marvelous animal heads. She has reasoned that perhaps her creations will avoid the need for at least some “trophies.” Indeed, perhaps we all need to start thinking along those lines. As to the sasquatch, hair is an interesting subject. Non-Native human males have continually-growing head hair and facial hair; females have continually growing head hair, but no facial hair. Native North Americans are the same except males and females do not have facial hair. It appears those males who do, reflects interbreeding with Europeans. 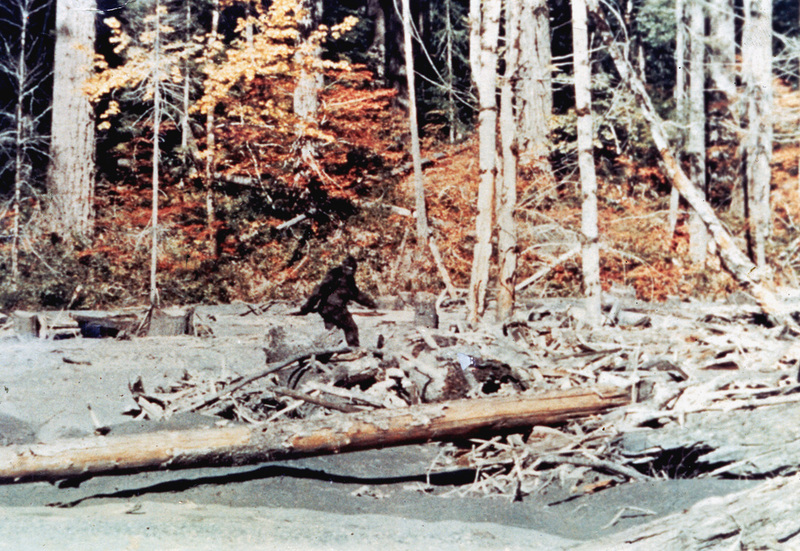 If the sasquatch is human-related, then males likely have to cut their head hair and facial hair at some point. However, male facial hair effectively eliminates a direct sasquatch connection with Native people, whose males do not have such hair. 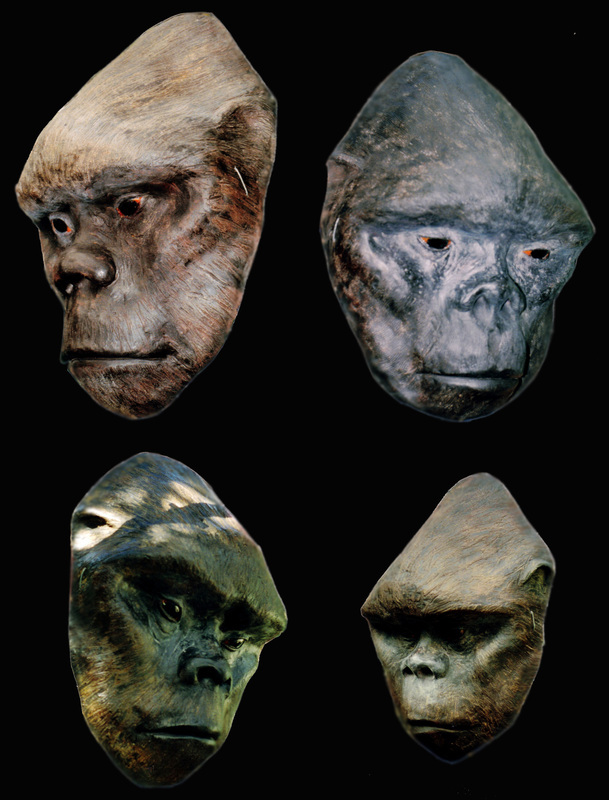 If we now “cross the gap” and consider a direct sasquatch connection with other primates, such as gorillas and so forth, then there is no issue. These animals have non-continually growing head hair and facial hair in both males and females. 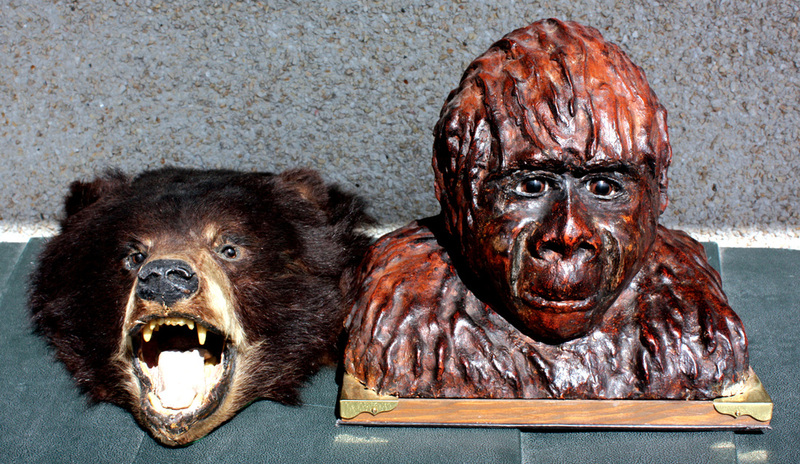 A comparison between the head of a bear and that of a sasquatch. 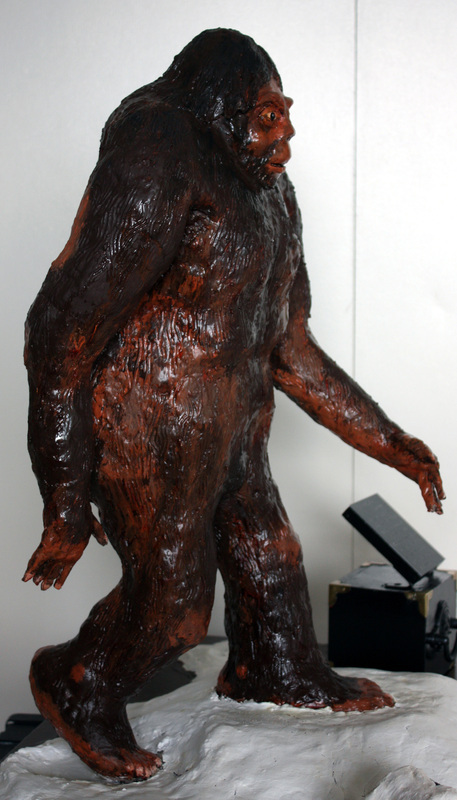 Authorities often say sasquatch sightings, even those at close range, are likely bear sightings. Native people and experienced woodsmen are often insulted when told that they probably saw a bear. The differences are beyond obvious in both the head and the body. little display might provide some insights. 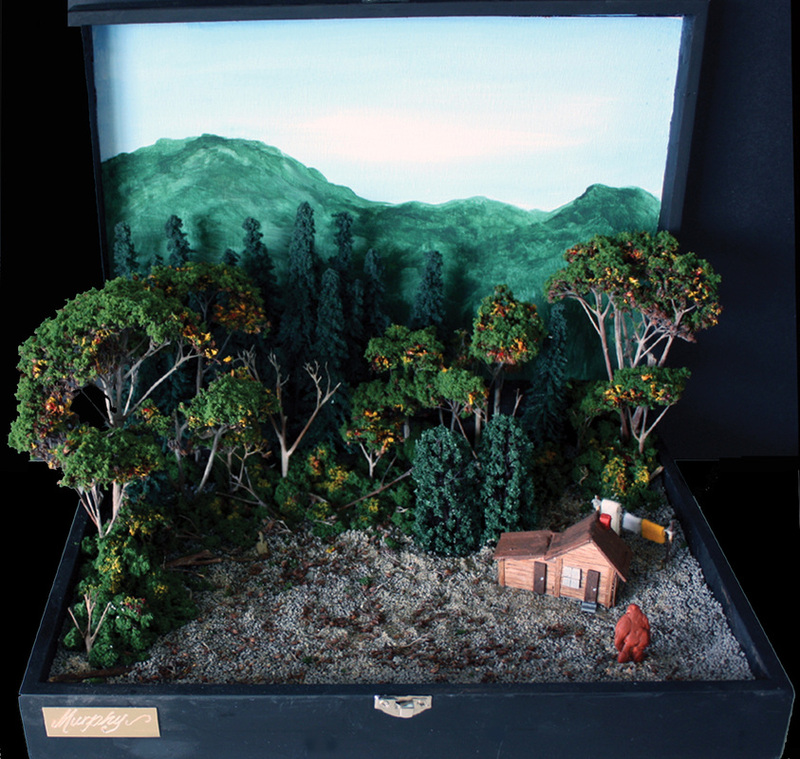 A diorama of the Ruby Creek incident, September 1941. 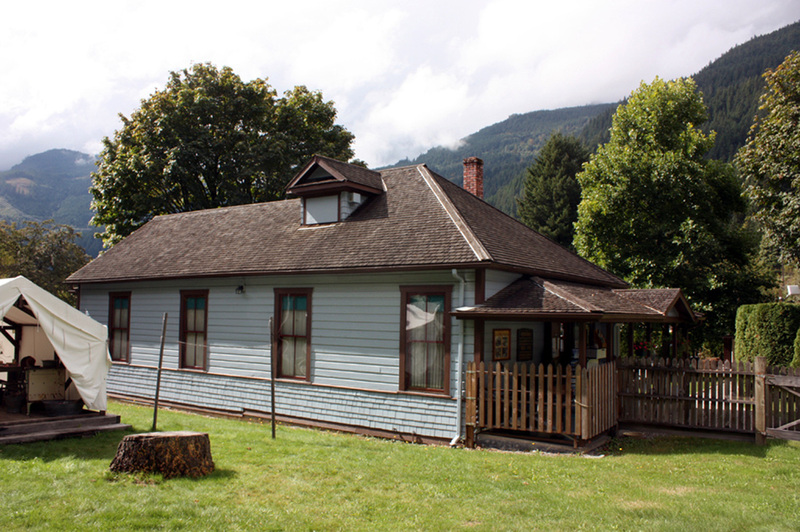 A sasquatch approached the Chapman house causing Mrs. Chapman to flee with her children. Footprints 17 inches long were found on the property along with other evidence of the unwelcome visitor. A cast was made of a print and later traced on brown paper. To the left is a clay scale model of the tracing. 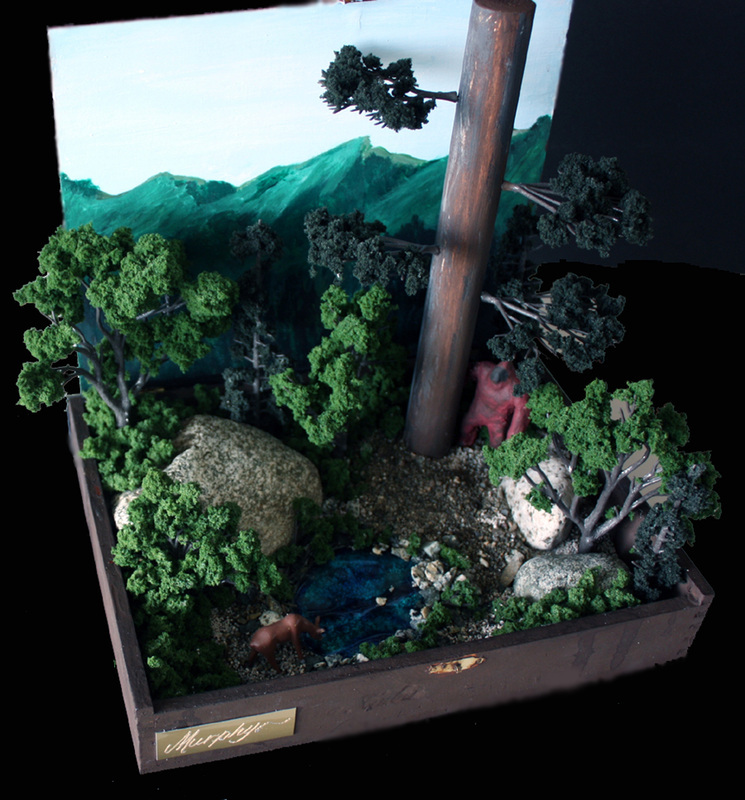 Diorama of a sasquatch watching a fawn drinking from a little pool of water. We believe deer are a food source for sasquatch, so scenes of this nature likely occur. How do sasquatch catch and kill deer? They apparently have the speed necessary and are probably very efficient at throwing rocks. It has been reasoned that if a rock lands near you when out in the woods, the miss was on purpose. 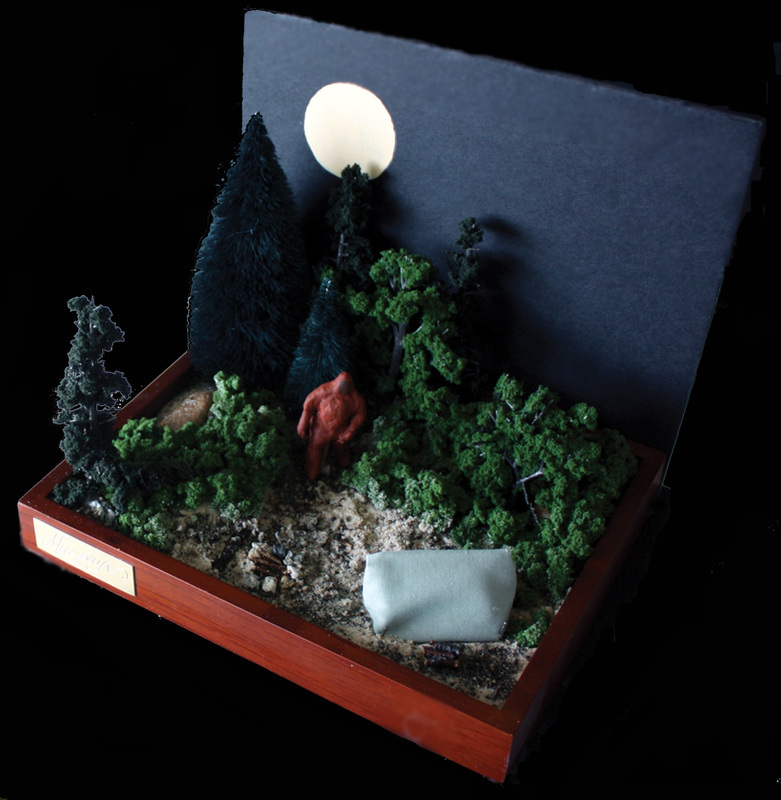 Diorama showing a sasquatch approaching a camper's tent in the dead of night. There a number of accounts of campers hearing strange noises and seeing frightening shadows on their tent walls. They are generally too afraid to peek outside. There has never been a confirmed account of any sasquatch aggression in these cases, so what might be happening here? It appears sasquatch are simply very curious which is the case with animals of higher intelligence, especially domesticated dogs and cats. 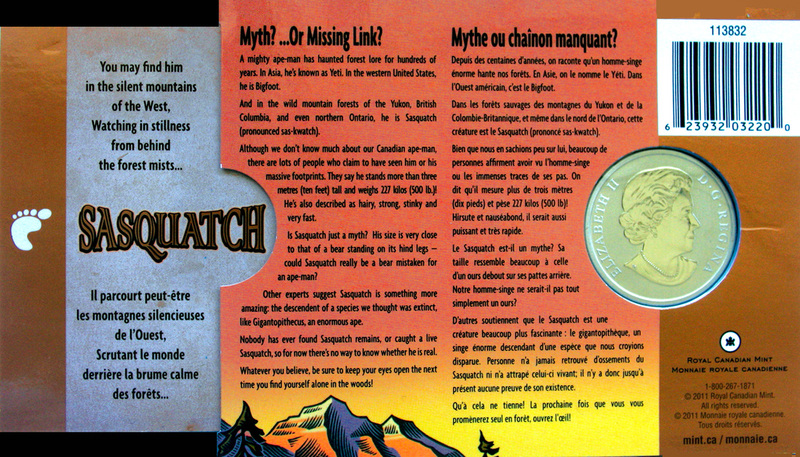 Canada’s sasquatch coin and presentation case (front and back). 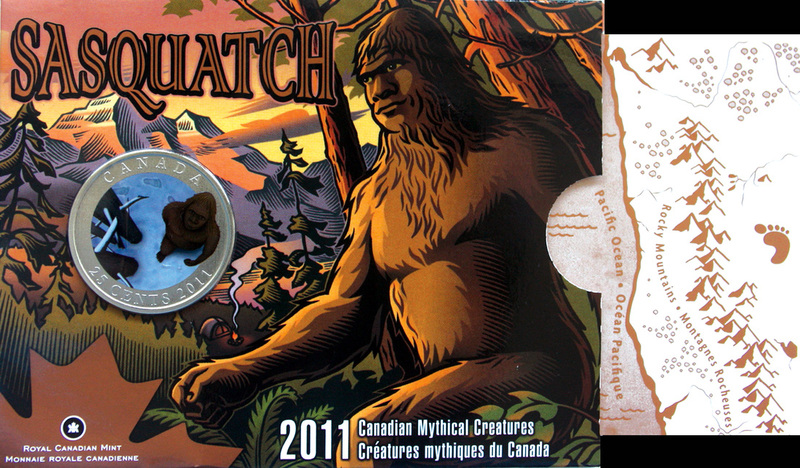 Canada is the only country that has issued a coin and stamp featuring the sasquatch. A stamp was issued in 1990. 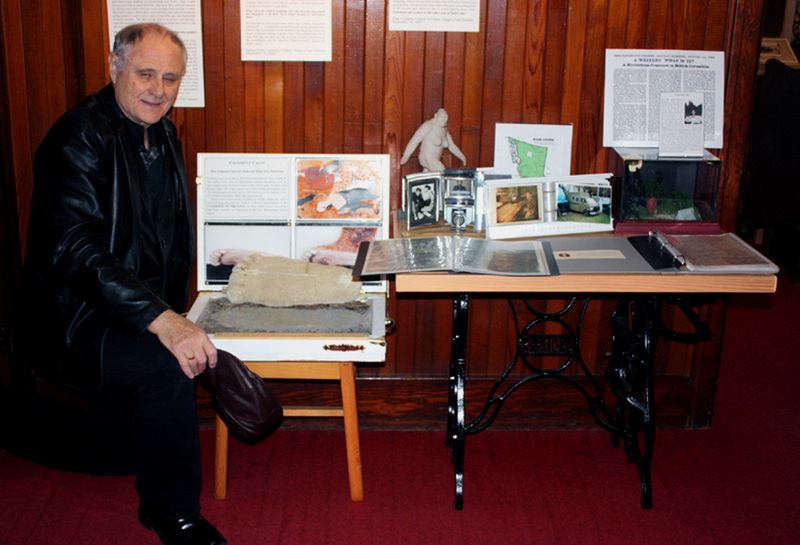 The following are various shots of me and my exhibit. 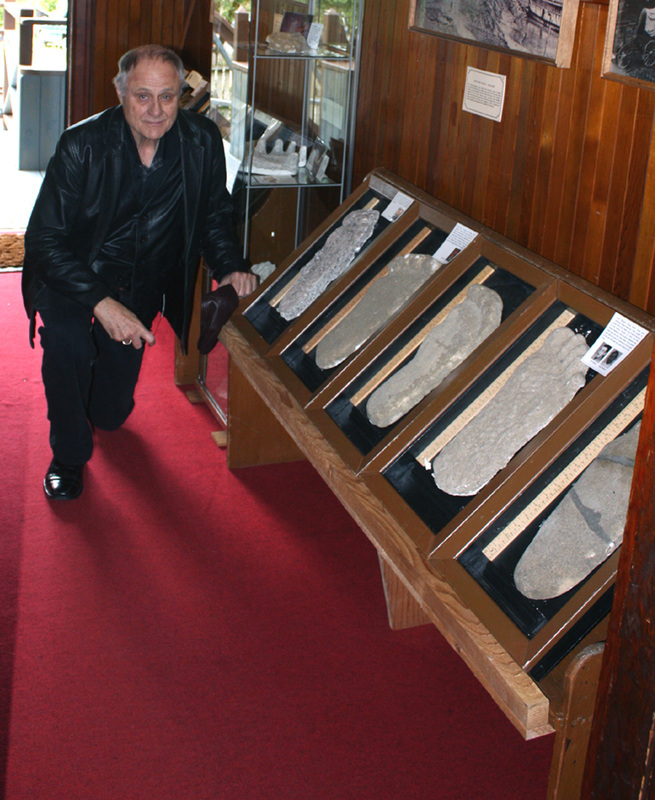 You will notice the various artifacts and other items on display that I have discussed in this entire presentation. However, there are many more items not covered. Indeed there was not enough physical space for many posters, charts and so forth. 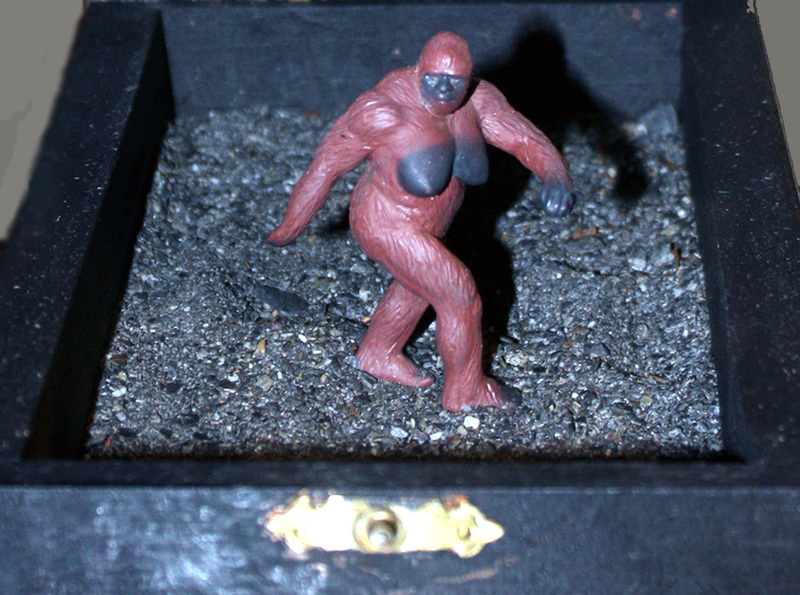 Nevertheless, this is a TRUE sasquatch exhibit. It was not hampered by fears as to what professionals or critics would think. 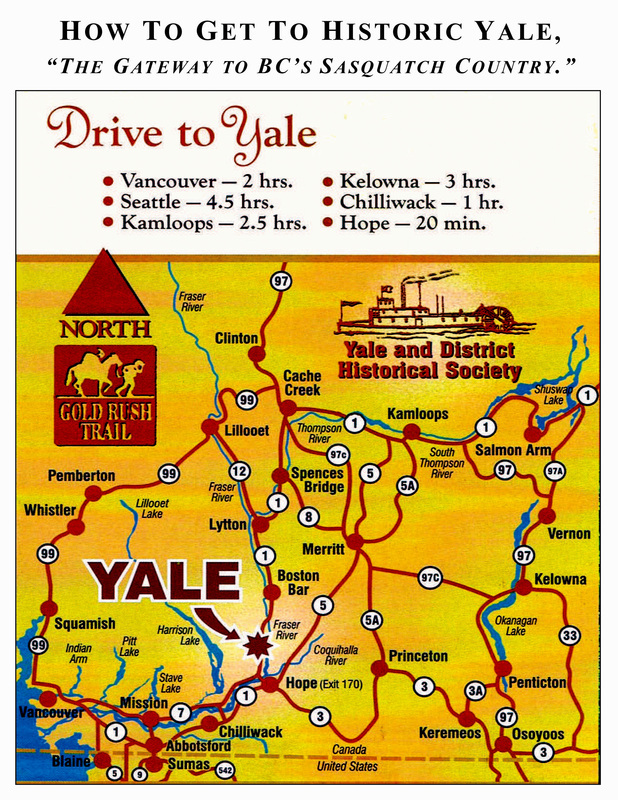 Please visit the Yale Historic Site webpage at http://historicyale.ca/ for current and planned events. 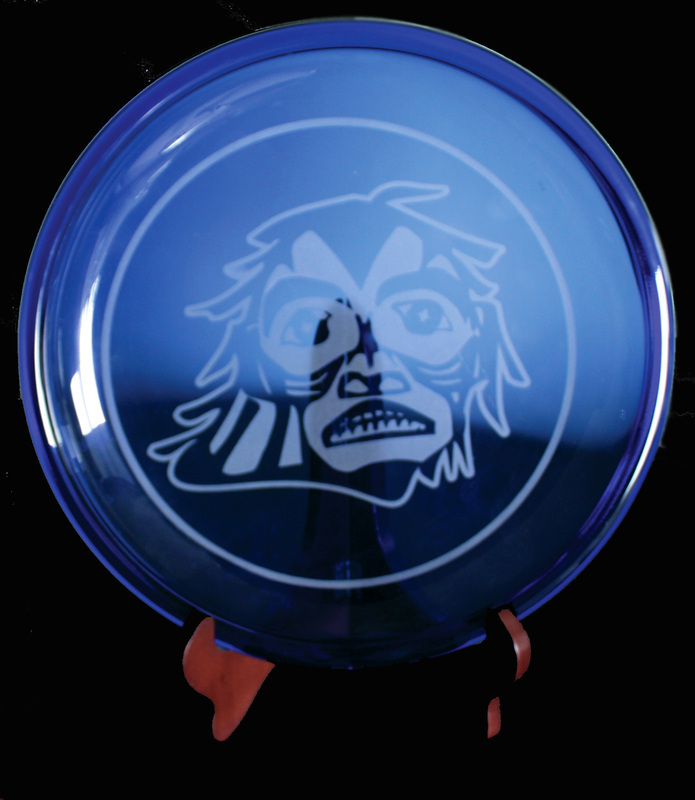 Your trip to “Sasquatch Country” will be filled with adventure. 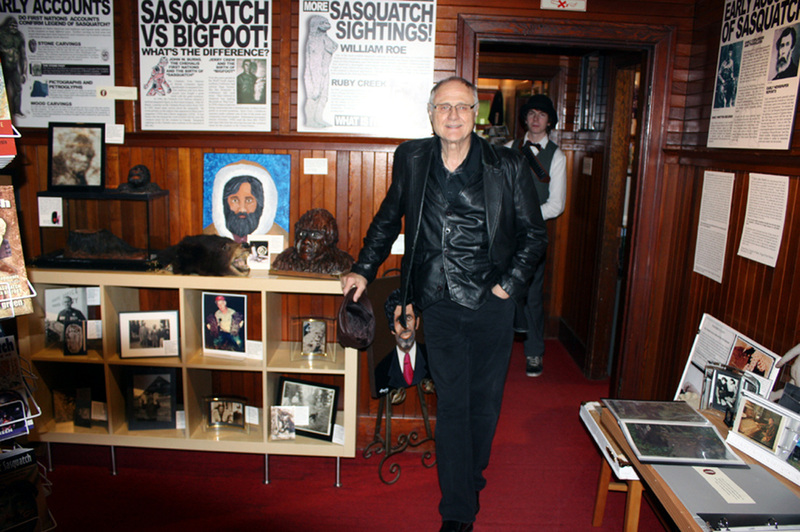 I would like to extend my thanks and appreciation to Deb Zervini and her husband, Richard; other members of the Yale Historical Society, and all the other wonderful people who assisted in providing my sasquatch exhibit. 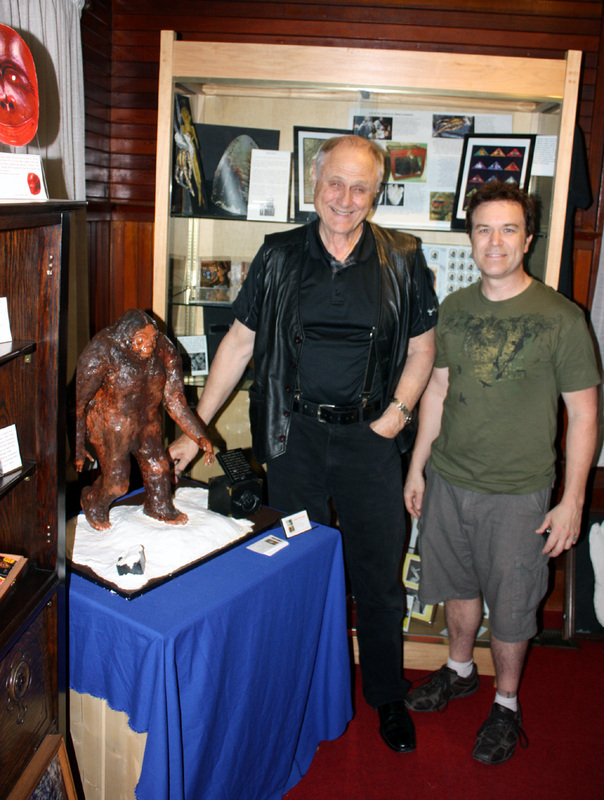 Also to Hancock House Publishers which has supported all of my sasquatch-related endeavors for many years, and to Candy Michlosky for providing this remarkable web presentation. 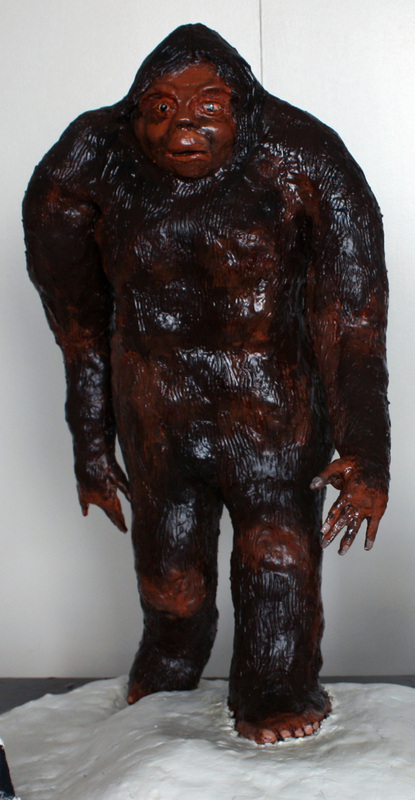 That the sasquatch is an integral part of the culture of the Pacific Northwest is a fact, regardless of one's opinion as to its physical reality. As such, it provides an opportunity to learn and appreciate the wonders of the vast land in which we live.